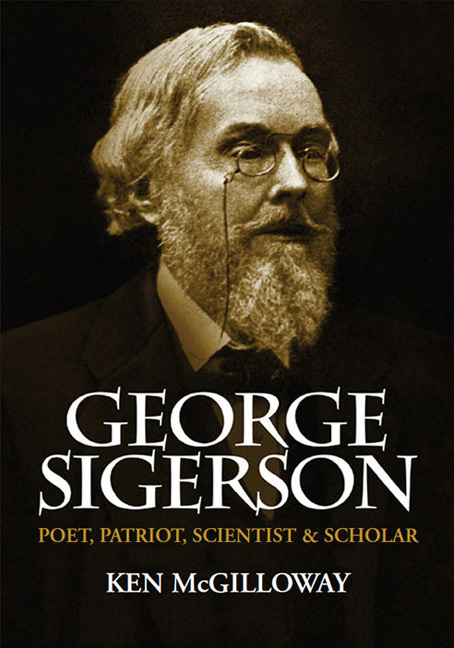 George Sigerson: Poet, Patriot, Scientist and Scholar. Born in 1836 near Strabane, Co. Tyrone, George Sigerson was educated in Paris and University College, Cork, where he studied medicine. He became one of the foremost authorities on diseases of the nervous system, a university professor, and a prolific writer on scientific subjects. An outstanding linguist, he made an historic contribution to the Irish literary revival through his translations from Irish into English verse, first of The Poets and Poetry of Munster in 1860, and then in 1897 of the monumental Bards of the Gael and Gall. He was president of the Irish National Literary Society from 1893 until 1924. His pen was never idle in arguing the cause of Ireland over a wide range of controversial issues such as the land question, the establishment of a National University, prison reform, the established church, the poor law and social and economic conditions. An intimate friend of Charles Kickham, John O'Leary and other Fenian leaders, and later of the poet and 1916 signatory, Thomas MacDonagh, he maintained correspondence with the leading political figures of his time, while his home in Clare Street in Dublin was a meeting place for more than forty years for literary people interested in the Gaelic revival. He was appointed a member of Seanad Ãireann in 1922 and was chosen to preside at its first meeting. Douglas Hyde's hope that the Irish people would never forget the memory of this great man will at last be fulfilled with the publication of this biography. The fruit of many years of research by Ken McGilloway, it draws on the recollections of Sigerson's daughter, Hester Sigerson Piatt, contained in a hitherto unpublished manuscript, on the author's conversations with Hester's daughter, Eibhlin Humphries, and on letters, photographs and other materials which she made available, on contemporary published sources, and on the author's collection of Sigerson's own publications. The book also includes a chapter on the history of the Sigerson Cup ' the oldest national trophy in Gaelic games competitions ' written by Donal McAnallen, co-editor of the highly acclaimed The Evolution of the GAA. Ken McGilloway was born in the Waterside area ofDerry in 1940 and educated at the Waterside Boys' School and the Christian Brothers Brow of theHillSchool,Derry. He left school at the age of 16 to become a trainee window dresser in a local furniture store. Six years later he moved on to become manager of a new textile shop in the city, eventually becoming manager of their Coleraine branch as well. After another 13 years he decided the time had arrived to became his own boss. In 1973, McGilloway Fabrics opened inButcher Street,Derry. He had always been interested in art and, in the mid-1980s, fulfilled another long-held ambition by opening theMcGillowayArtGalleryinShipquay Street,Derry. He retired from business in July 2010. RRP: £16.99 | You save: £7.00!